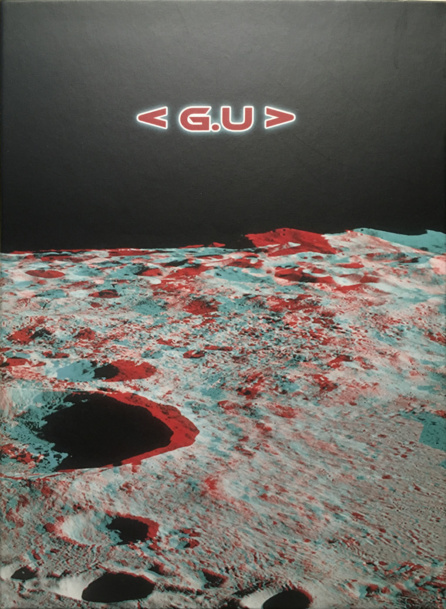 Before me lies the late-2017 released album “Galactic Underground”, or short, <G.U>. It is the debute of a new project by Venja. 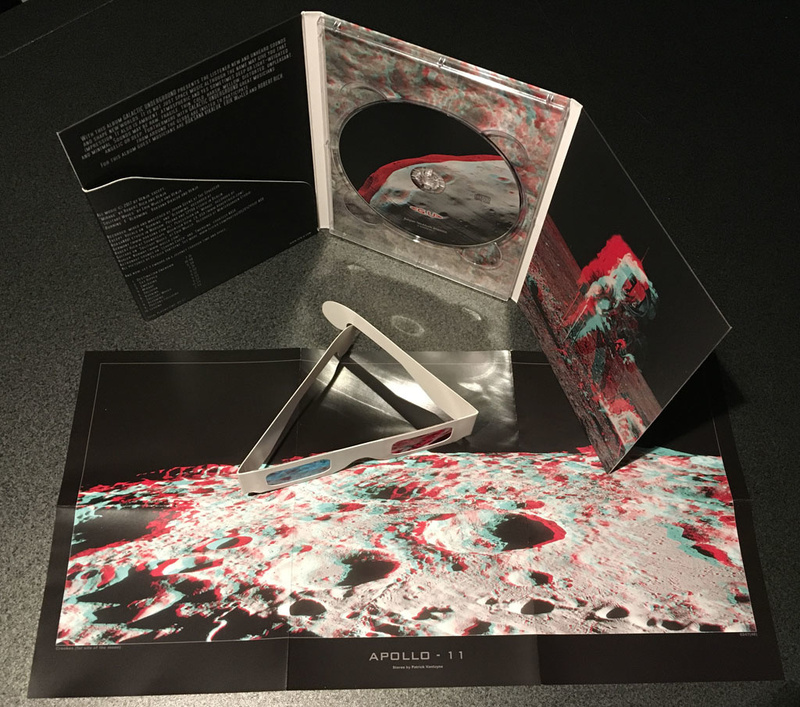 The album is a rather unusual sized outstanding tri-fold digipak with center CD tray, and an insert consisting of a folded poster and a real retro-style pair of 3D glasses. The inserted material gets a bit in the way when closing the tri-fold. It is released as Belgian NeuMusik BNM005 (Chapter 5) and distributed under Wool-E Discs catalog number WED020. The print work is performed with a smooth silky matte finish, which is a bit sensitive to greasy fingerprints or soft scratches, but this satin finish adds a valuable touch to the overall minimalistic design of the cover. Info is gathered on the first inside panel of the digipak, all the rest is artwork. On the back resides the necessary marketing info that needs to be visible when the album is still in its plastic wrap, but in a way that it totally blends with the lunar surface photography. A brilliant concept. All images have been printed as red/cyan stereoscopic artwork, made by Patrick Vantuyne. Typically, the artwork features NASA lunar missions, but the space element in the music stretches far more further than that, as will turn out. Analysis of the music contained on the single shiny disc. Destination unknown. A very floating and cosmic piece of work, a full palette of sounds in all layers. As an opener, you instantly feel Venja is at the keys; that significant warm and crisp sound. Sky ripped. Actually it takes off where the previous track left us – warm waves and airy cosmic sounds. The sound effects tell a story of lost transmissions in space, of unexplored territories and yield a view on what’s yet to come in the album. After about 6 minutes without gravity, a bassy sequencer emerges, building some tension that ads to the story.With these two tracks you can’t help yourself closing your eyes and feeling drifting on a space walk in orbit. Emerging. Vast sweeps and loungy strings weave an immense sound carpet (and excuse me for repeating myself) floating in space. The NASA Apollo mission network radio check sounds really decorate this track. Mirage (with Robert Rich; percussion by Robert). In contrast of the three previous tracks, this one tells a story of the home planet. It depicts the beauty of distant deserts. The nightly field recordings and ethnic percussion draw the listener right back to memories of the ancient origin. Tribal fires and rock paintings, stories of ancestors’ ancestors; it humbles. Oblivion. Seamlessly the music transcends into the next track, but this one has a more “marine” kind of ring to it. Probably this is because of the metallic sounds in it, which also can make you feel like standing on the top of a Nepalese mountain… It’s a bit of a harsh track, with raw organic sounds in a positive way. I’d like Venja to explore more in this field – Oblivion is a track that could easily last 30 minutes without getting boring. Solitary Waves (with Erik Wøllo; guitars by Erik). Drifting over undiscovered plains and valleys on distant planets, or gliding under liquid surfaces of sequestered moons. That is the feeling this track evokes. Mainly three things going on in this short track: the background sequence, the strings and the guitar. But the simplicity is key to the complexity in this great piece of collaboration between Erik and Johan. Blooming (with Roksana Vikaluk; vocals by Roksana). Again, Ukrainian vocals shed a veil of mystery over the fluently evolving music. This song is a bit more downtempo than “Burning”, and as such it feels somewhat heavier. There is an aura of Christmas around it. Leaving (a.k.a. “Leaving Earth”). This track closes the loop on this overall fabulous album. A heart beat, radio static, and the nice swirling background notes that seems to be the typical sound throughout all tracks, a short comeback of the NASA radio test… these all make up the very short outro, which announces the end of the album, but maybe also the beginning of your own dream journeys into space. 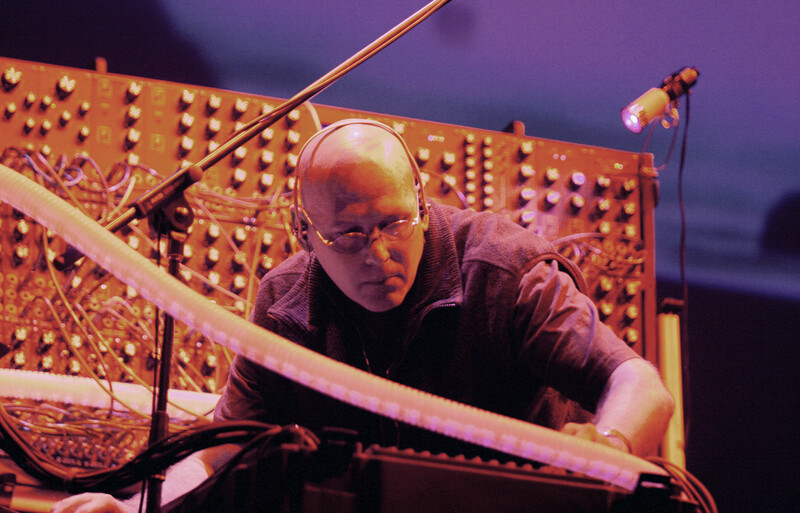 Overall, the music is a carefully weighed balance between ambient, space and classical electronic music. A very crisp and abundant mix with certainly enough depth. Sometimes raw and harsh, sometimes smooth and subtle. The invitation of artists around the world did work out very well; as such there is enough variation but Venja carefully tied all music together without losing the global coherence. I certainly hope we see more work coming in line of the Galactic Underground project. Previous: Details for COSMIC NIGHTS 2018 revealed!